What a week it’s been for us! After a month long period of Jacob just sort of swimming in the glory of being able to sit up, we are having a week jam packed FULL of new milestones! 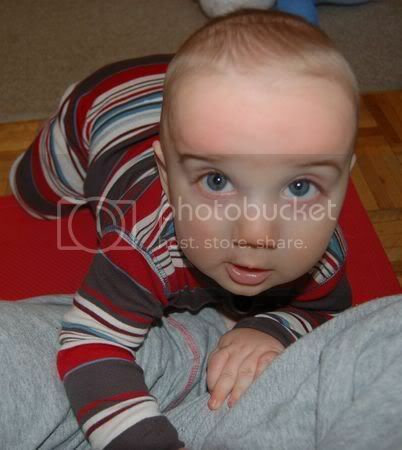 First, as you may have read he started getting TEETH….this experience has been the bane of my existence since it began! I long for the days when he is happy again! He is just miserable as these teeth start to push their little white faces through his gums and I am hoping that it is over soon – at least for a little while; the kid deserves a break! 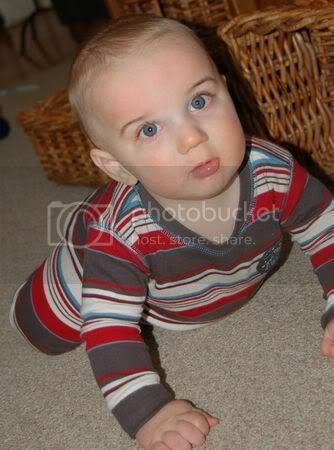 Late last week Jacob started to creep along the floor or “commando crawl” as it is often called in mothering circles! He just woke up one morning and decided if I want that toy I better get it myself and since then Mommy and Daddy are becoming aware of all the child proofing they need to do around the house. I am amazed at his fascination with the things around the house! The first to go is our cast iron tall candle holders that Jacob is just over the top amazed with…give him a second without supervision on the floor and he has commando crawled his way over to the candle holders and playing with them! I dread what would happen if one of them fell over onto his head! 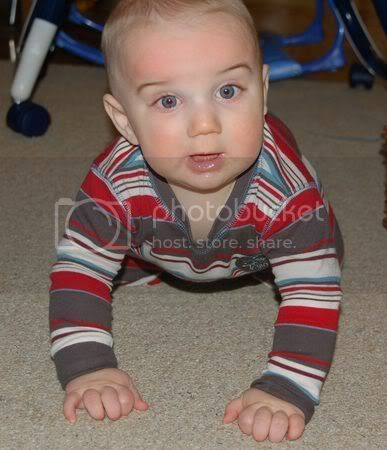 Who came up with this term “commando crawl” anyways….Jacob is doing the crawling like a soldier trying to make his way across a field – but alas my son would be captured in an instant! Why? Well because when he’s doing the creeping sorta crawling thing he’s being very vocal about it; proclaiming his victory for all to see! He gets his voice going with grunts, squeals, and noises so that you know how hard he is working to get to his drop and roar dinosaur or god forbid my cast iron candle holders! Two days ago Jacob decided he wanted to be up on all fours..so he’s spent the past two days just sort of sitting up on all fours rocking back and forth. He will look up at us as if to say “this is too much hard work for me Mom and Dad” and then he plops back onto his tummy and does his commando thing. It’s ok tho…I’m completely content with the slow commando crawl because i know as soon as this kid figures it out – he’ll be all over the place – practically unstoppable; I know this because I’ve seen those crawlers at baby club – they get into all sorts of trouble! So I was sitting down last night thinking wow this has been a good week – we’ve had lots of change and Jacob seems to be just blossoming. I was sure we’d seen as much as we were going to see for perhaps another month until I went into Jacob’s bedroom this morning to get him from his crib and discovered him sitting upright in his crib just smiling and playing with his stuffed duck. ACK! He knows how to get from his stomach to sitting now? Oh geebus! It’s time to lower that darn crib mattress and fast! So tonight while I watch American Idol with a bowl of popcorn and a diet coke….Mike will be lowering that darn crib mattress! Nothing else is new….Jacob is still eating the same – about 28 ounces of formula a day with two tablespoons of cereal and 1/2 jar of fruit for breakfast and then 4 tablespoons of vegetables for dinner….I’m not sure what new foods will be next but I’m pretty sure it will be meat of some sort once he hits 8 months old! Ack! 8 months old? That’s just over a week away – I need to go lay down – my heart is racing!